When a property has a physical termite barrier installed, there needs to be a visual inspection zone (i.e. a v joint in the render) If this joint is covered then the termite barrier may fail. The photo here shows the correct installation. 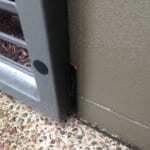 Additional termite barrier product behind the gate posts prevent concealed termite entry.